KIBERA SLUM - JULY 11: A 31-year old single woman takes care of 9 children who are her nieces and nephews in the slum of Kibera in Nairobi, Kenya on July, 11th, 2010. Her brother and his wife died of HIV and her sister died in 2008 after ingesting 25 aspirin to terminate an unwanted pregnancy. 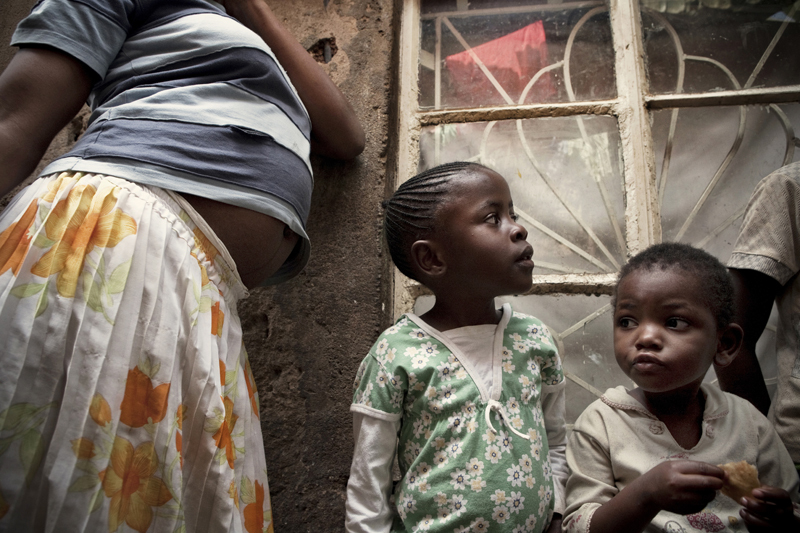 Their children now live with her in a single room in Kibera. "It is very difficult to bring up all these kids alone, work is unpredictable, we usually skip lunch and porridge is our main meal in the evening." On a good month she can make up to 1,500 Kenya shillings, on a bad month she will only earn 900. Her 17-year-old niece who also lives with her is 6 months pregnant (pictured). Her boyfriend left her after learning of the pregnancy. She contemplated an unsafe abortion but her aunt and her pastor urged her to keep the child, as an abortion is life-threatening procedure in Kenya.